The Collective Bargaining Agreement that keeps the players on the field, the fans in the seats and the pockets of the owners very, very healthy is set to expire a few short days after the season ends and for a few months now the players union and the league have been meeting trying to hammer out a deal. By all accounts it seems like a new deal will ultimately get done but there may be more than a few new changes and tweaks to the game when it’s all said and done. One aspect of the game that is expected to change is the luxury tax threshold which is expected to rise to or above the $200 million mark while another bit of news was released this week as well regarding the possibility of an international draft. While nothing is set in stone preliminary talks have suggested that a international draft system would start as soon as March of 2018 with 10 rounds of draft picks being taken in two days. The minimum age for draft-eligible players would be 18-years old by 2021 with the current group of eligible players grandfathered in despite their age. This should not come as a shock to anyone and no one should think this will necessary hurt the Yankees in any way. 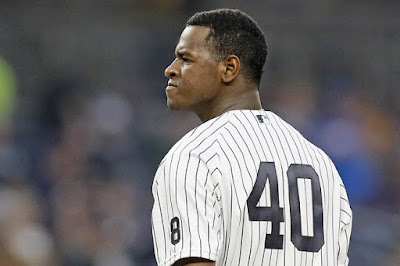 The team has had some success on the international market but with the spending penalties and restrictions put on the team after their international haul from a few years back it will likely benefit teams like the Yankees in the long run and not hurt them as much. That’s my opinion anyway. Regardless of what I think it looks like an international draft is coming and for some it isn’t coming a moment too soon. For others, well maybe they aren’t as happy about the idea. Oh well, such is life. I personally like the idea of it all. Signing IFA’s is so much of a crap shoot it’s beyond ridiculous, at least MLB can somewhat monitor who is being signed now. Seriously, I need help with this one. # 40?....I have not a clue. last two debates,........big time. Too bad. I don't know Patrick. I've seen too many young guys messed up from war, and I feel trump will only try and lead us into bigger and larger wars against some of the biggest countries in the world. and it's easy to stand in front of everyone and say you will bring companies back to the US and lead to massive economic growth, but saying and doing are two very different things! Not that I will be voting for Hillary. I think we should start a Greedy Pinstripes movement to pencil in Ken Reed onto our ballots. Thanks, but NO THANKS Daryl! They would never let me win, even worse than they are with Trump! I am a true strong Conservative that believes in God, Country, Flag, and the REAL American way...and the Liberals worse bad dream. I spent many years putting up with their Fu-ked up ideas of how NOT to win wars, everything they do is motivated by Money, Power, and Politics not the problems at hand! The ends justify the means! The Republicans are run by keeping their power in Washington D.C. The Establishment wants to keep their power more than winning, therefore any outsider for either party may as well give up! The party will find a reason to not help them as they would any party member. And the republicans had control of both houses and were afraid to fight for anything. There is a reason I've ridden along side Ken Reed, for all these years. Just read his above comment. On point ! The point is.....at times he, and I, are sooooo on the same page. Daryl, don't let the media fool you. The Clinton Witch is the one that will steer us into a war. She has medical issues, and lacks common sense.